While getting a new phone, the first thing that bothers us is how to get the files from the old device to this new one. But thanks to technology for making such things easier than ever! There are many apps and software available that can assist you in accomplishing this task. You might have heard about T-Mobile content transfer app before. Well! Many of the users have not liked it much unlike others and therefore, we found it right to share you a substitute for this app. Hence, this article is going to introduce with you an excellent alternative to T-Mobile content transfer. Let's get started and fulfill the purpose. The T-Mobile content transfer app allows the users to execute transferring of a wide range of data between phones. For instance, you can move your images, videos, contacts, etc. from one phone to another without any difficulty. Also, the content transferring with T-Mobile can be done for iOS and Android devices. Putting differently, this app is there for both Android and iOS devices. It is a wireless process i.e. there will be no need of PC while you use this. Besides, with this app, you will be shown the transfer time as well as option to move only the selected files that are needed at the moment. Well! We would like to inform you that using the app mentioned above is having some limitations. Here's an entire list of limitations of using T-Mobile Content Transfer application. One of the biggest drawbacks of using T-Mobile content transfer app is that you will always need a strong Wi-Fi connection. As long as the Wi-Fi connection is stable, the app will work smoothly. However, when the network is shaky, you might get a hard time while transferring the data. And that is why the following mentioned alternative will be a sound choice. Another thing to be noted is this app needs more than Android 4.1 version and iOS 8.0 to work. The devices having lower Android and iOS versions than 4.1 and 8.0 respectively won't be able to transfer the data. Reportedly, users have been facing strange issues while transferring data with this app. It has been recorded in their statements that they have experienced some data loss in terms of corrupted photos after transfer or other corrupted data. Well, the T-Mobile content transfer app is not an ideal option if you wish to get your data transferred in lesser time. Relatively, the app consumes a huge amount of time than other content transfer app available out there. Here you go! 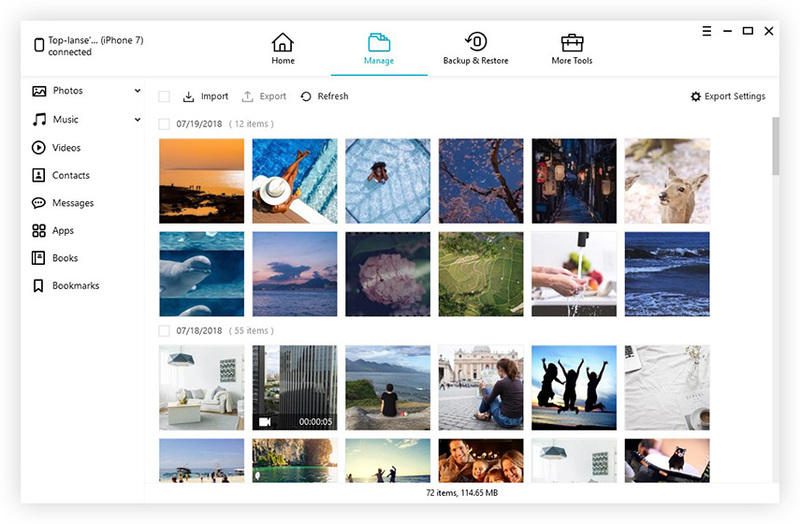 One of the most effective alternatives to T-Mobile content transfer that can help you transferring various contents between phones is Tenorshare iTransGo. It is the safest tool and able to support any iDevice. No matter what iOS version your iPhone is running with, this tool has the capability to work. Moreover, you can transfer your files selectively via iTransGo. This tool takes one-click operation which is completely time-saving and also offers an intuitive design. The steps for transferring are given below. Step 1 – Install and launch iTransGo in your respective PC and plug the two device between which the transfer is needed to be done. Hit on the 'Next' button now. The button with flip icon will allow you to switch between the source and target devices. Do as per your needs. Step 2 – Now, your data from the source device will be scanned by the program. Also, the capacity will be shown in the target phone. Step 3 – Now, either check the box next to 'Select All' or check the preferred contents to selectively transfer the data. Once done with the selection, click on 'Start Transfer' button at the bottom. Step 4 – You will be prompt that your app data will be erased in the target device. Select 'OK' and proceed. Now, wait until the process gets over. Also, make sure not to disconnect your devices while the process is going on. When you get notified that the transfer is completed, detach your devices and enjoy the data in the new device. We have mentioned you the top T-Mobile content transfer app alternative. Tenorshare iTransGo is undoubtedly a useful tool for transferring the contents between the iOS devices. Being compatible with the two major operating systems including Mac and Windows, iTransGo can be considered among the most excellent tools and one can't ask for more. We hope you took delight in reading this article and would appreciate if you would share your experience using the tool with us. Just drop the comment below and let us know if you have any query.